We look forward to welcoming you to Portland House where we offer spacious en-suite accommodation just a short walk to the town centre, Theatre and Lake. We are proud to hold the Visit England 4 Star Silver and Breakfast Awards. All our rooms are comfortably furnished and include a hospitality tray with our home made shortbread and little extras to make your stay special. We have a total of 6 ensuite rooms. Three are flexible rooms, room 1 on the ground floor is accessible for wheelchairs and can be either twin bedded or as a superking and has a large walk-in shower room, rooms 4 and 5 are on the first floor and can be double or twin bedded. Also on the first floor is a double and a single room. 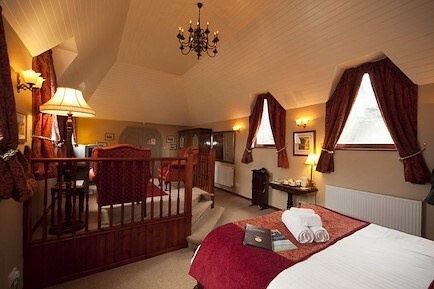 On our 2nd floor we have a spacious room with a Kingsize bed. We have completed some major refurbishments and all rooms have super powerful showers in their modern en-suites. Free WiFi access is available for guests. Our delicious breakfasts will set you up for the day whether you choose a full Cumberland breakfast or one of our lighter options. We serve a range of FairTrade beverages and can provide a packed lunch with prior notice, fill your flasks free of charge, or lend one for your stay. Guests are welcome to use the secluded seating area in our sunny garden. Weather and time permitting we enjoy exploring this beautiful area on our motorbike. We welcome bikers and can provide off road parking for bikes. As an ambassador for the Theatre by the Lake, we can obtain discounts for some productions for guests and can book and collect tickets. All major credit and debit cards are accepted including American Express. Exit the M6 at J40 Penrith and follow the A66 to Keswick. As you come into the town centre and approach traffic lights the War Memorial is on the right. Turn left into Station St and immediate left into Southey St. Approx 250 metres along Southey St turn left into Church St. Approx 150 metres on left is Portland House on corner of Church St and Leonard St. Your enquiry will be sent directly to Portland House. Please fill in as much detail as you can.